Go Visit Ireland are pleased to offer you a selection of equestrian tours and horse riding holidays based in Kerry in south-west Ireland. Discover Ireland’s highest mountain range, the MacGillycuddy Reeks while riding on quiet country lanes and mountain paths. Smell the wild Atlantic ocean while riding on award winning blue flag beaches of Rossbeigh and Derrynane. Choose from the following breaks. A three night equestrian package based in Kerry, suitable for all levels of experience with 4 hours horse riding over 2 days. A three night Equestrian Break for all. 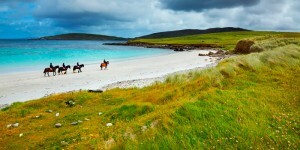 Make your dream of horse riding along a beautiful golden beach come true on the Derrynane Equestrian break. Derrynane beach is one of the most beautiful in Ireland. Enjoy an afternoon’s horse riding in wonderful open countryside or along the coast. Discover the welcoming village of Caherdaniel with its teahouses and pubs. Relax over a drink in the evenings and perhaps partake in some traditional Irish entertainment. Dates: Any time of the year. Price: €295 per person sharing. Minimum of 2 people. • 3 nights accommodation in an Irish Tourist Board Guesthouse based on two people sharing with ensuite facilities. • 2 days horse riding (2 hours per day) accompanied by a qualified instructor. • Suggested walks or cycle routes of the area. A three night equestrian break based in Kerry for experienced riders. Price: €510 per person sharing. Minimum of 2 people. • 3 nights accommodation in an Irish Tourist Board Guesthouse based on twin sharing with ensuite facilities. • 6 hours horse riding per day for 2 days accompanied by a qualified instructor. Your base for the three nights is the picturesque seaside village of Glenbeigh, on the Ring of Kerry in Kerry Ocean Lodge, a luxurious 20 bedroom guesthouse. The horse riding trails have been designed to make the most of the splendid local beach of Rossbeigh and the inland mountain paths and scenery. All rides start at 10.00 am and finish around 4.00pm. Below is a sample itinerary of some of the possible rides offered. Ride 1 – The ride starts out through Glenbeigh village and on to the locally known high road, passing Wynn’s Castle. From there you will travel through Seefinn mountain over the Windy Gap. As you leave the views of the Atlantic Ocean behind, the breathtaking lakes of Glencar set the perfect scene for you to enjoy. A rural Ireland setting will be on view for the rest of the day. The evening trip back in to Glenbeigh has wonderful views over the ring of Kerry as the Caragh River meets the Atlantic. Ride 2 – The ride starts at Rossbeigh beach, which is 6 miles long surrounded by over two hundred and fifty acres of sand dunes. 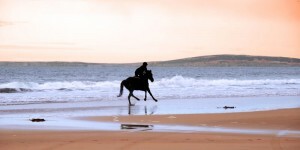 Riding on Rossbeigh beach is an experience riders of all levels will never forget. The Dingle mountains to the North and the Iveragh mountains to the south enclose this heavenly beach. After lunch, a trip back along the coast road and over the Rossbeigh hills, will relax you after your day’s adventure. Ride 3 – Today’s ride takes in all the valley of Glenbeigh. You first head for the locally known Ballinakilla Townland before you get to see the splendour of Coomasharn Lake, a sight never to be forgotten. After lunch you ride across the bogs and onto the townland off Letter and as you head for home, Rossbeigh beach comes into view in all its glory. Ride 4 – A ride through the farm and across the mouth off the Behy river takes us onto Killnabrack Strand. The McGillycuddy Reeks stand out in the surrounding countryside, as does Dooks golf course stretching out into Castlemaine harbour, both wonderful views. A quiet ride through the local townlands takes you back to Rossbeigh Beach where we continue to ride on this seemingly everlasting beach. This is a 6 night trail ride with 5 full days riding for experienced riders. Price: €1,520 per person sharing. • 6 nights accommodation in Irish Tourist Board Guesthouses based on two people sharing with ensuite facilities. • Transfer within the trail ride of Riders and luggage, your tack and horse. Dates: May to October. Please enquire for further details. The trail starts at Killarney Riding Stables on Saturdays. The day begins with a short transfer of riders, horses and luggage to the base of Seefinn Mountain, where the ride starts. When horses and riders have been introduced, the ride heads off, and up over the Windy Gap, viewing the splendour of Caragh Lake and the valleys beyond. The ride then continues on to Coomasaharn Lake enclosed by Horseshoe Mountain, followed by a scenic ride over an Irish Bog, finishing for the day at our stables in Mountain Stage. The overnight stop for Sunday and Monday nights is in the quaint village of Glenbeigh. (Glenbeigh comes from Gleann Beithe, the Glen of the Birch Trees). Surrounded almost entirely by mountains, Glenbeigh offers a famous friendliness and humour which is nowhere better found than in this tranquil and charming region of Kerry. The beauty of the area is breath-taking, with the River Behy and Rossbeigh Strand close by. History is evident throughout the locality and such a destination as Winns Folly Castle is well worth a visit. After breakfast on the second day the riders return to the stables of the previous evening and begin Monday’s ride. The day is spent on Rossbeigh beach, galloping along stretches of golden sand and exploring magnificent sand dunes, returning from the beach via the Cliff road. On Tuesday, while the luggage is transferred to Waterville, a morning ride takes horse and rider from Kells Station through the bogs of Cnoc Bawn and on to Liss Bawn, taking in some spectacular views of Caherciveen and its surrounds. Lunch is served alongside a nearby forestry. After lunch we continue on through Island Boy and the Inny Valley. The overnight stop for Tuesday and Wednesday nights is spent in the coastal village of Waterville. Waterville, the little whirlpool, nestles on a narrow strip of land between Lough Currane and the Atlantic Ocean, in the very centre of south-west Kerry. Situated as it is between the seashore and the impressive mountains and headlands, the area has many interesting routes to offer and many fine beaches. The first Celtic invaders are reputed to have landed in Ballinskelligs Bay, coming ashore near Waterville. These beginnings of the Gaelic Nation are echoed by the Archaeological remains such as those on Church Island, at Derrynane Abbey or Skellig Michael, giving the area a wealth of history.Wednesday brings an adventurous morning spent in Tulligane Woods, riding through the Inny Valley and lunching by the Inny River in an old School House. Afterwards enjoy a scenic ride into Waterville via the old Glencar/Waterville road, along the shores of the famous fishing lake – Lough Currane. The final accommodation transfer is made on Thursday. The day begins with a brisk ride to Waterville beach, spending the morning enjoying some exciting gallops. The panorama of Hoggs Head and Ballinskelligs Bay conjures up the afternoon ride in Waterville. Afterwards, both horses and riders are transferred back to Killarney. The final day’s riding follows routes through some of the 19,400 acres of woodland, mountains and lakes of Killarney’s National Park. Ride along the shores of Lough Lein, with extraordinary views of the 16th century Ross Castle and Ross Island. Lunch is served back at the stables and the afternoon is left free for shopping and extra sight-seeing.